This exquisite 108 bead mala can be worn as a necklace or bracelet. These stones are 6mm in diameter and are hand knotted on silver thread (I do not use silk or natural fibres to knot my gemstones as the stones will cut through the thread in no time at all). 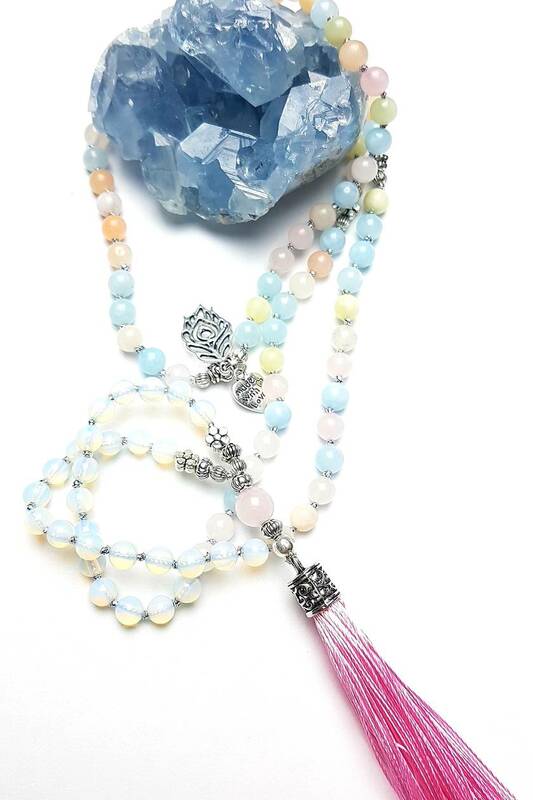 18 Opalite beads begin and end the round, bringing their own unique rainbow magic to this mala. 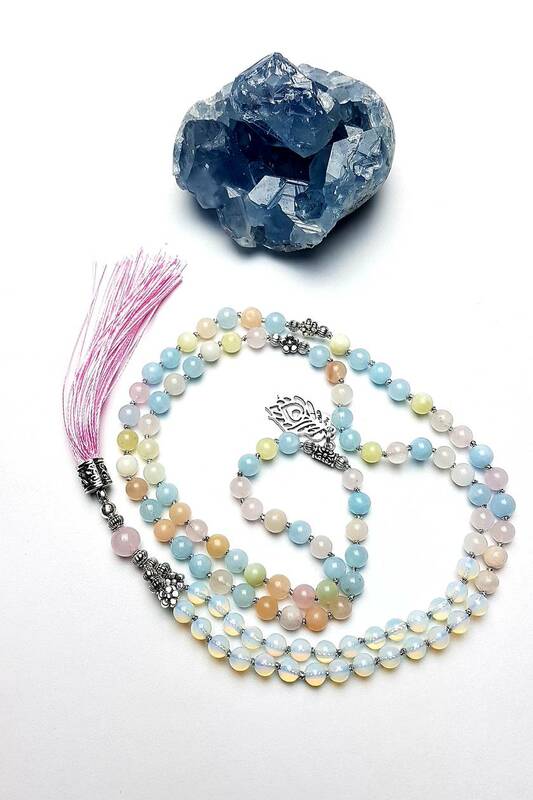 Silver tone findings create interest and drama and a lovely pink tassel finishes off this beautiful one of a kind mala. "Morganite will bring you the frequencies of compassion and kindness. This stone will help you realize that your bad experiences and challenges will be the catalyst for moving forward or making that big change in your life. They will make you discover your own strength and courage, and they will give you peace and confidence to just keep going! Morganite will make you appreciate life with joy and reverence. It may not be a rich, popular, or successful life, but it’s your life. You can make anything happen with it should you wish to do so. Morganite will give you a clear vision of your goals and just what you need to do to achieve them. It will help you find clarity in a situation, and it will amplify your intentions to the universe. It can help you attract energies of prosperity and abundance, and it will give you good luck just when you need it!" "Opalite is a man-made synthetic glass, mistakenly known by a number of different names, including - Tiffany Stone, Opalised Fluorite and Purple Opal. 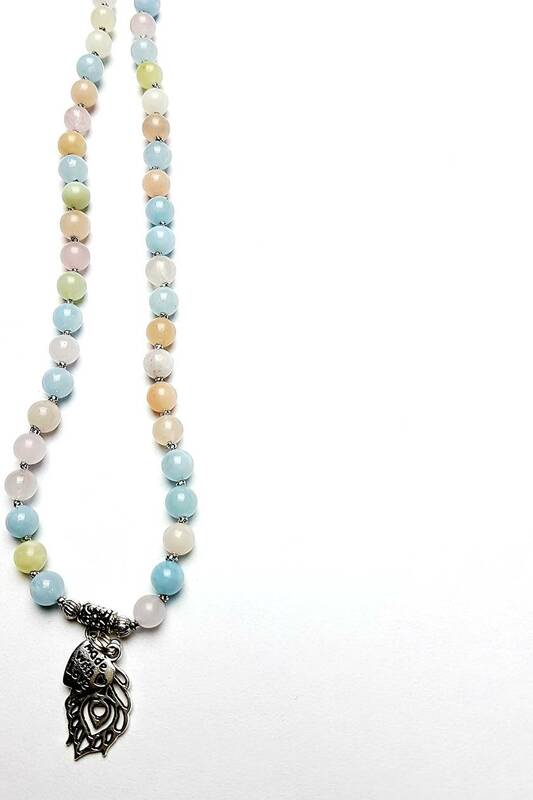 ... Opalite improves communication on all levels, especially the spiritual. It removes energy blockages of the chakras and meridians." 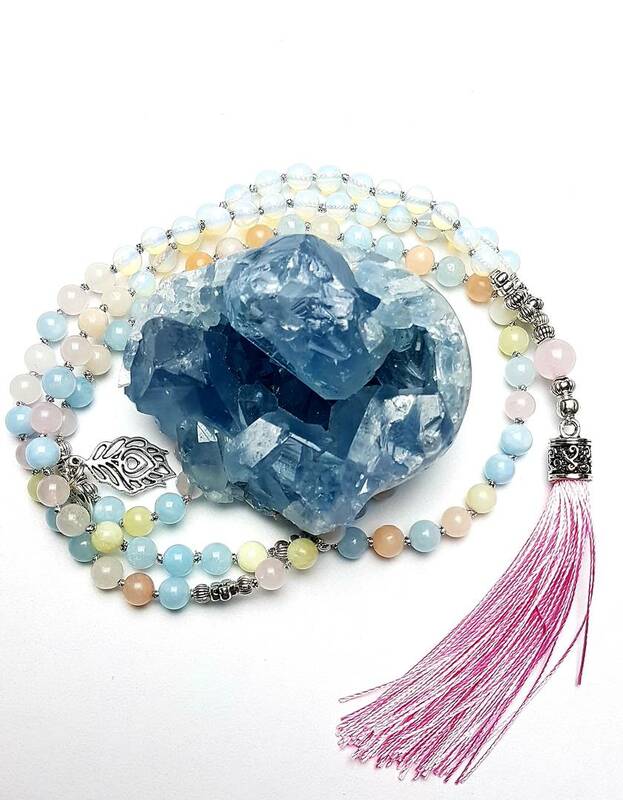 All my malas are made by me, Natasya, in an environment of peace and harmony, each strand is lovingly created and infused with positive energies.